As many people discover the benefits of promotional outdoor advertising and it's low cost, sponsoring companies are supporting local events with branded signage banner printing fixed to strategic spots around the crowd. It's a fantastic idea for business advertising and so cheap for event management companies to arrange. Decorating your event with impressive printed displays is not totally customizable by you. As used by vehicle car promotions, shows and events, festival and event management companies you can set any kind of customized size suited to your marketing plans. They are expertly positioned to make your customized banner printing signage and you can upload your creative designs and printing begins. 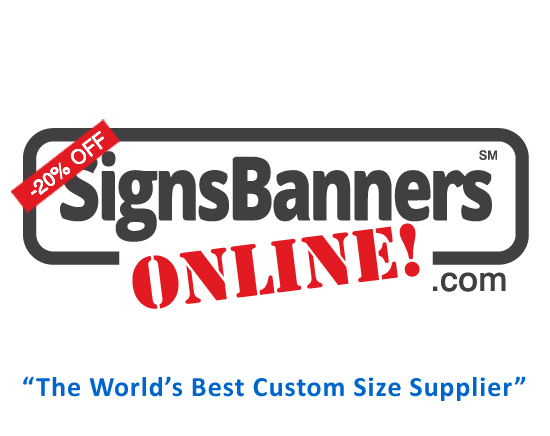 There is also a live chat facility where you can talk person to person to the factory and answer all your queries before online ordering of a banner sign. A great idea for promotions and sales events, managers can forward the specifications to their design firm for quick set up and online printing.